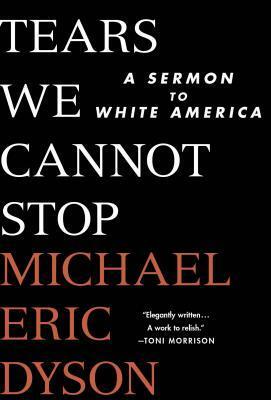 Michael Eric Dyson’s Tears We Cannot Stop: A Sermon to White America takes a decided stance on racism in America in 2017, particularly within the context of the election of Donald J. Trump as President of the United States of America in the 2016 presidential election. Drawing from personal experience, anecdotal research, and data, Dyson illustrates the situation of the black man in America with poise, empathy, and clarity. Written as sections of a sermon, the book is directed at white readers but offers a great deal of material for American citizens and, indeed, beyond. With regular references to the reader (often, “beloved,” as you might expect in church), Dyson effectively draws the reader in prior to beginning his argument for better treatment of African Americans. Much like officials including Trump’s name frequently in reports meant for his consumption in order to maintain his attention, Dyson’s frequent addresses to the reader does a powerful thing in actively engaging and interacting with the reader who might, without proper empathy instilled, wonder what this has to do with them. To get to the debate of what this has to do with them (assuming the reader does not see the poor treatment of other humans as relevant to their own lives — a reality, to be sure, for many), Dyson must first get the readers on his side. He does this beautifully with these gentle call-outs — calling readers in by name. Beloved. Paired with the history of the word beloved in black culture (think Toni Morrison), this method is hugely impactful to cultivating the reader’s attention. It is this language, however, that also contributes to a softening of Dyson’s call-out. He is empathetic to a fault, acknowledging directly that confronting racism within yourself and your peers is challenging. At times, Dyson seems to imply that confronting this racism is just as difficult and emotionally traumatic as it is being on the receiving end of racism — whether it’s personal or systemic. He concedes having white guilt is difficult and how white folks in America do have it hard. In doing so, he distracts from the central issue of racism and what people of privilege can and should be doing about it. In many cases, Dyson’s arguments are strong for those of us who are already on-board. But aside from stating that white folks have it hard as a result of their own racism and using inclusive terms like “beloved,” his arguments are rarely anything new or particularly persuasive for someone who might disagree or is undecided. This is a tough thing to achieve. Certainly those who need convincing are the least likely to pick up the book in the first place, so this may be a misinterpretation of the purpose or target audience of the majority of the book on my part. That said, the book is highly relevant for modern times. Dyson regularly refers to Trump, Ferguson, and other current events that make the book an immediate call to action. With — well, I don’t know what, luck? Hard work? — with any of whatever it is that we need, we’ll not need this book for too long. And, even more-so, news moves fast. Trump, we’ve seen, moves fast. Tears We Cannot Stop is a static piece of writing that, though perhaps able to be updated in reprints or new editions, will not remain relevant in its current form for long. These are ongoing problems, certainly, but the specificity sometimes takes away from overall goal. Still, Dyson wraps up his work with an immeasurably useful chapter on real, practical actions readers can take to mitigate the strain of racism. Ranging from tipping people of color extra in their work to reading dozens of more writers on racism in America, these suggestions are some of the strongest I’ve seen in terms of making activism actionable in real people’s lives. Not everyone has the capability to organize a rally, but a good deal more people can effectively choose to patronize establishments owned by black people over white, and thus help even the playing field. The list of writers Dyson offers in terms of further reading is also impressive and helpful, though another format might have made the list more accessible. Tears We Cannot Stop is readable and interesting, but won’t do much to bring new folks over to Dyson’s side. The actionable items at the end are invaluable and well-organized for those who stick to the end and feel inspired by Dyson’s sermon. As a piece of literature on racism, though it might not lend a lot of new material to the subject, it’s an important one and likely to become part of the canon.